Niagara, Hamilton, Windsor, London, Brampton, Durham, Barrie, Collingwood, Kingston. Looking for a QUALITY Canadian-born homecare brand to partner with? Qualicare is the most unique, comprehensive and involved homecare model in the industry! Fulfilling both Medical and Non-Medical services, our Care Coordinators also support clients and their families through our 360° Approach – the methodology which provides the utmost in resource collaboration, service coordination and healthcare advocacy. This approach allows us to provide the highest form of homecare support, helping us achieve award-winning client satisfaction levels and positive recognition and referrals from medical professionals in our industry. Are you our next Franchise Owner? Building strong relationships in your community and following through on what you say you will do is key. Your entrepreneurial drive, desire to help others, leadership and vision are just a few things that will help you to be successful in this industry. Making a difference, improving quality of life, going above and beyond the call of duty…being the BEST. That highlights our Owners; the way they think, the way they live and how they contribute back to their community. Is this you? Our model is based on a two person team with one sales/marketing operator and the other an RN or RPN nurse to manage the client side of the business. Your success is our success! From the moment your application is approved and contract signed, you are greeted by the Training, Development and Support team who get you up and going as quickly as possible, without fear of doing it on your own. Training, coaching, monitoring and continuous feedback for improvement, guidance and support with all procedures required, help with software implementation and use, brand building, sales and marketing direction…the list doesn’t stop and neither do we. We are there to ensure your success as a Qualicare Franchise Owner…and that never ends. 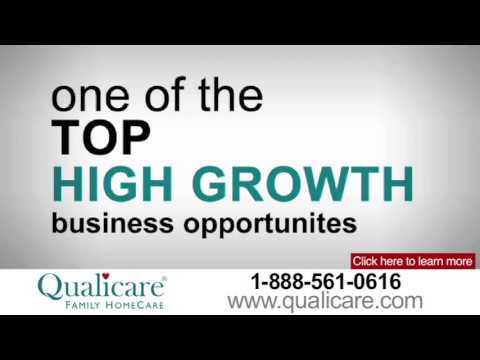 what makes us different and why you should partner with Qualicare Family Homecare.